Bakers lane named after the bakery that was located at the junction of Bakers Lane & Mill Lane. Also this plot was previously the site of a windmill. The map below drawn by William Shipton in 1792 shows Mill Lane (then called Coppice Road) running diagonally from left to right, and Bakers lane, then marked as a dotted footpath and called Butterley Foot Road. 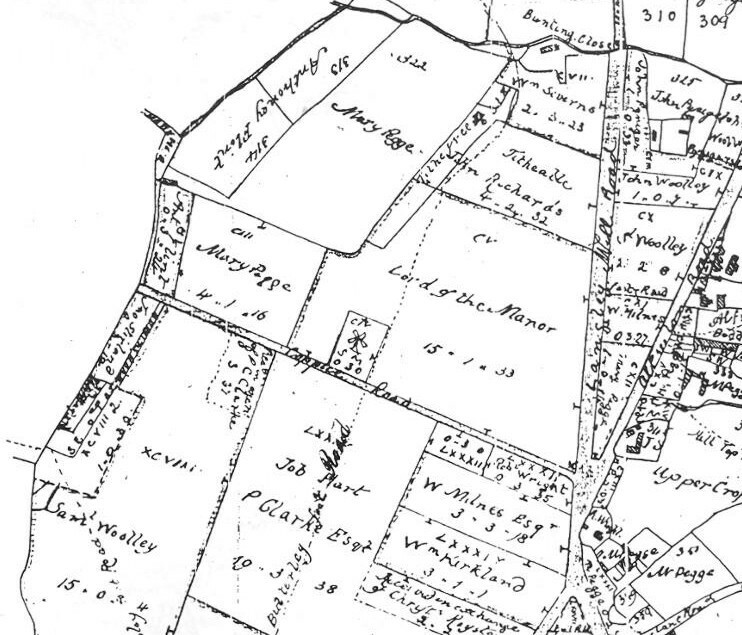 On the junction of these two roads in the centre of the map is a square plot containing the windmill owned by Samuel Millward. During the later 1800s a shop with large two storey building to the rear, exiting onto Bakers lane and two terraced houses were built on this plot. For many years my wife lived at the shop when it was owned by Mr & Mrs Derek Hardwick. First when it was a grocers shop then later when it was Derbyshire Electronic Services. (D.E.S.). When Mr & Mrs Hardwick first purchased this property, the bread ovens were still in place. Previously the general store had also been owned by the Lowes and before them the Cresswells. Fig.2 Entrance to Bakers Lane 2007. 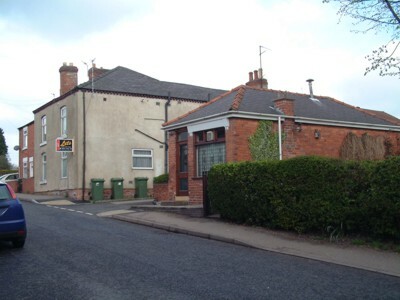 The single storey building in the foreground is owned by William Severn and for many years was "Severns Chip Shop" This photo is taken after it was closed. My Granfather told me that the route marked as Butterley Foot Road was still used when he was young by miners going to work at Brittain pit and Western Fan pit. It started at West hill and went up the jitty between the two allotments and out onto Jessop street beside the shop. It then went over Jessop street and continued at the back of the gardens between Wright street and Needham Street, exiting out of the arched entry between the terraced houses on Mill Lane. It then crossed over Mill Lane and straight down Bakers Lane, across the fields (there was no Wood Street) and down to the brook near the bottom of what is now Smith Avenue. It crossed over the brook by small wooden bridge, then up and out onto Stirland Street. Straight over Stirland street and up the short lane that brings you out onto Codnor Gate. It crossed over the road and continued past Lynams farm and through what is now Codnor Gate Industrial Estate. Through the style,down the fields then up through Woolacotts farm and out onto the coach road. The last part is over the coach road through another style and over a couple of fields to bring you out at what is now The Butterley Railway Centre & farm. During the late 1970s Derek Hardwick sold some of the land at the top of his garden as a building plot. Two houses are now built on this plot on Bakers lane. Before the land was sold I was working in the garden removing an old path. When I lifted some of the bricks from the path I found several bottles all placed in a line upside down. 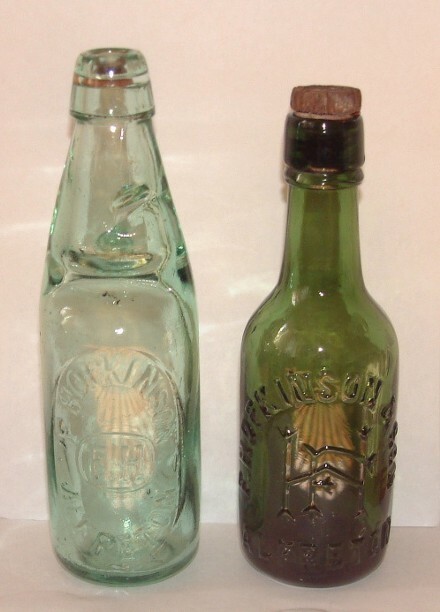 They all date from the later part of the 1800s and are good examples of the different stopper patents that were used at the time to try and overcome the problem of sealing bottles of aerated water. Fig.3 (Left) C.W.Southern, Belper. A Blob top bottle, this would have been sealed with a cork, Ok for mineral water but the gases in aerated water would push out the cork. (Right) R Taylor Somercoates. This has a Vallet Patent stopper, a wooden plug and sealing washer held in place by the pressure of the gas. To open the bottle, the stopper was knocked inwards and a lead (thats right I said lead) plug prevented the stopper from floating. Fig.4 (Left) William Fletcher, Ilkeston. Another Vallet stopper manufactured by Redfearn Bro's in Barnsley. (Right) Holbrook & Holmes, Heanor. A rare Sutcliffe's Patent that worked on the same principle as the Vallet stopper but used a glass dumb-bell shaped stopper with rubber seal. 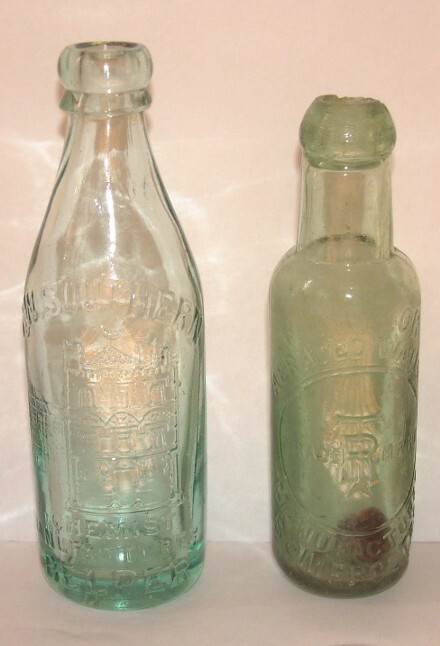 Fig.5 (Left) F Hopkinson, Alfreton This is a Codd's bottle invented by Hiram Codd. The seal is made by a glass marble held against a rubber O-ring by the pressure of the gas. To open the bottle, the marble was knocked inside and was trapped between two indents, which prevented it from blocking the neck when pouring out the contents. This is were the expression "What a load of old Codds Whollop" came from. (Right) F Hopkinson & Sons, Alfeton. 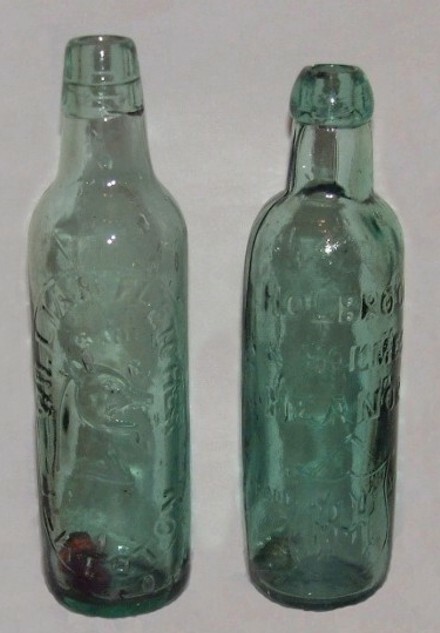 An olive green example of an early screw top bottle with threaded wooden stopper.